Bailey & Love is the world famous textbook of surgery. Its comprehensive coverage includes the scientific basis of surgical practice, investigation, diagnosis, and pre-operative care. Trauma and Orthopaedics are included, as are the subspecialties of plastic and reconstructive, head and neck, cardiothoracic and vascular, abdominal and genitourinary surgery. The user-friendly format includes photographs, line diagrams, learning objectives, summary boxes, biographical footnotes, memorable anecdotes and full-colour page design. 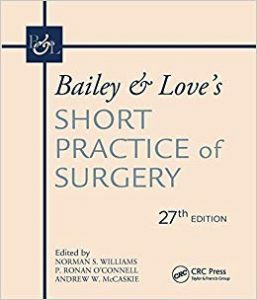 This book’s reputation for unambiguous advice make it the first point of reference for student and practising surgeons worldwide.